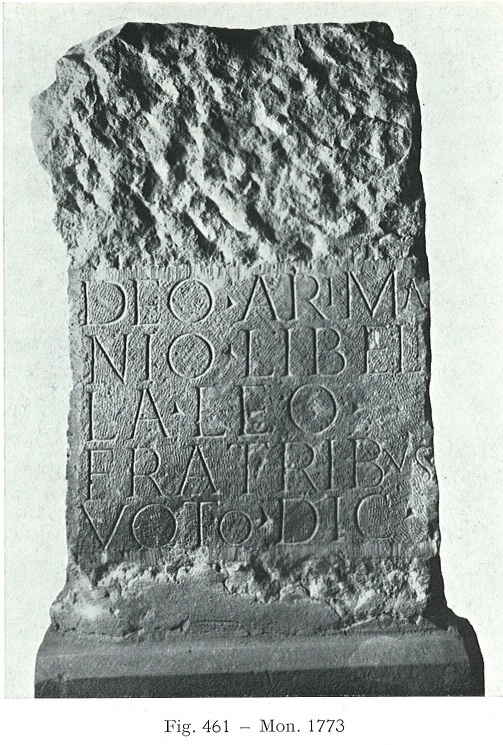 CIMRM 1773, 1774, 1775 - Altar to Arimanius. Aquincum V. Budapest, Hungary. Altar found in 1855 in "Altofen gegenüber der s.g. Kaserne Szent-Andrejassi" (Budapest, Szentendrei-ut 150) together with the following No. Here probably was a Mithraeum V.
CIL III 3415; MMM II No. 324. See fig. 461. Deo Arima/nio Libel/la leo / fratribus / voto / dic(avit). CIL III 3480; MMM II No. 325. Deo invicto / Mithrae C(aius) / Iul(ius) Cast/nus leg(atus) Aug(ustorum) pr(o) pr(aetore). Probably also the following No. 1775 belongs to the same Mithraeum. Base found "at Buda in the 18th cent." CIL III 3414; MMM II No. 323.